Back when I did freezer cooking every month and never let my freezer get lower than 100 entrees at any given time, Salmon patties were in my rotation. 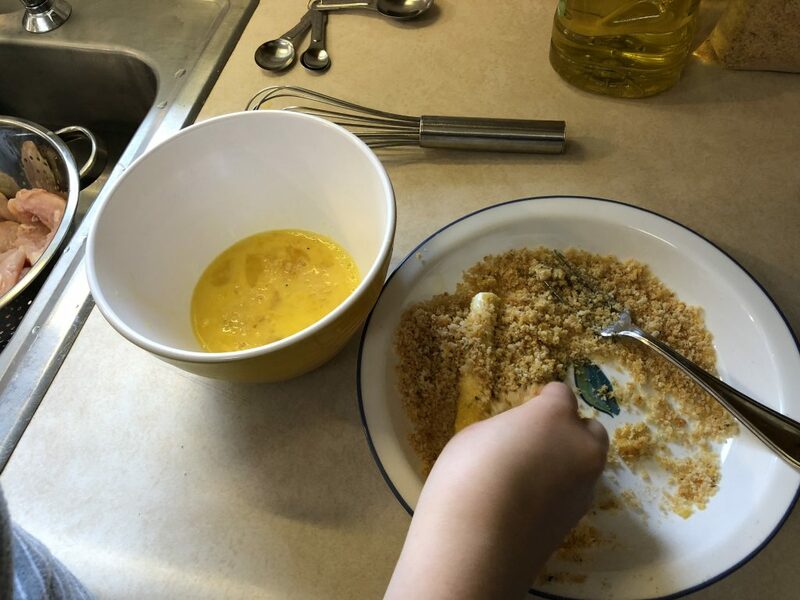 The recipe was so easy and quick that even my youngest assistant could mix them up and shape and flash freeze them (after an older sibling opened the cans for them). My kids loved crunching the bones between their fingers—much like the joy of popping packing bubbles, I guess. 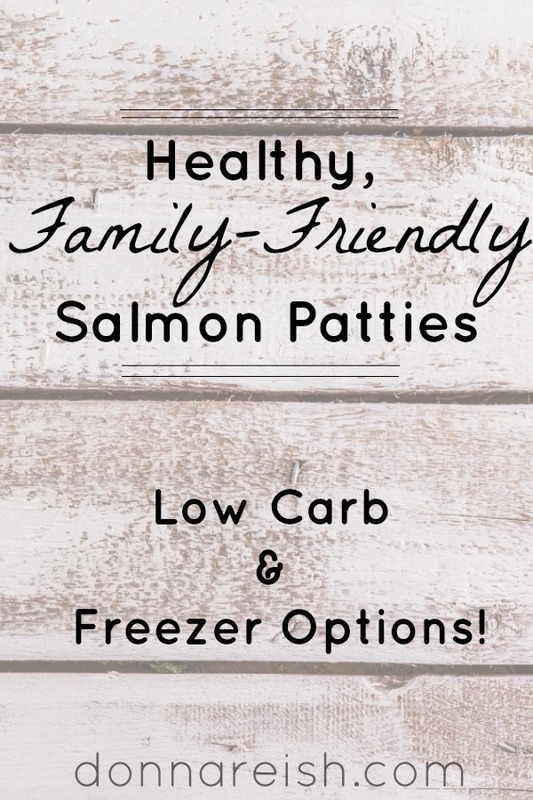 So to say that anyone can make salmon patties is definitely a true statement! If these are so easy, why bother making freezer entrees out of them? To make things even easier!!! Yes, you can feed 3-4 people with this recipe with only 10 minutes of prep time (assuming you already have your healthy crumbs on hand). And then you can simply skillet fry them while you do other dinner preps. Yet there is something so simple about getting a bag of these out of the freezer in the morning, putting them in the skillet while you prep some potatoes in the microwave or rice in the rice cooker—and veggies in the oven. (Learn more about oven roasting veggies here.) So convenient. 1) Flash Freeze—When you see this term, it usually indicates that you are going to freeze something quickly but not in its final storage/freezer state. In the case of meatballs, pizza burgers, chicken tenders, etc., this means that you freeze them quickly in one layer on cookie sheets or jelly roll pans (I use parchment for easy removal) then transfer to bags when they are frozen. I like time-saving, so when I say to flash freeze something, I really mean it. Ha ha….Stacking breaded raw chicken breasts in a foil pan or bagging up raw meatballs and then freezing in that state will result in a big slab of chicken breasts that can’t be separated (and with most of the breading off!) and meatballs that have become one oddly-shaped meatloaf! 2) Healthy Crumbs—Crumbs, along with eggs (and sometimes cream, sour cream, ricotta, etc. ), are binding agents. I have used them in cooking for a large family in many things—pizza burgers, meatballs, meatloaves, salmon patties, Salisbury steak, smothered “steak,” ham loaves—all of these things need binding agents. When people are trying to cook more healthfully, especially low carb, the “cracker crumbs” are usually the point of contention (which is a little funny considering that 2/3 cup of crumbs is spread out among 4 servings, which is like 3 TBSP of crumbs each, which isn’t that many carbs…however, if you only have 30 carbs a day to “spend”—like in a Keto diet—6 or 8 carbs in your meatloaf can really add up fast). So I set to work to solve the savory crumb problem in my “21 Ways to Crumb Low Carb” article. Take a look at it and my “Low Carb Breading/Filling Mix” one. 3) Tuna Balls or Patties—I mentioned that I used to have salmon patties in my freezer often when I had seven children at home. I had what I called “rotations” in my freezer cooking. (I even had a book of this method outlined, but the exactness needed in book print recipes deterred me…plus, I realize it was too complicated of a system.) Anyway, these rotations included “shaped cycle,” “shredded chicken,” “ground meats,” “whole chicken breasts,” and “side dishes.” In that shaped cycle, I had my salmon patties—and I also had “tuna balls,” which were basically salmon patties made out of tuna and shaped into balls. Believe it or not, we had these tuna balls with pasta and white sauce and my kids actually liked them. I say this to show you how versatile recipes really can be. This salmon patty recipe can be used for salmon balls, tuna patties, and tuna balls. It can probably be adapted for chicken patties and balls (with cooked, finely shredded chicken). Cooking isn’t always an exact science! 4) Labeling Freezer Bags—I know I sound like a broken record, but you will save yourself a lot of headache if you label your freezer bags and containers thoroughly. It is nearly impossible to tell what is in a bag once it is frozen. (This is surprising as it is so obvious what it is when it is unfrozen!) AND….get into the habit of always writing RAW or FULLY COOKED. Many of my freezer entrees can be frozen in various forms. Sometimes I can have some RAW chicken tenders and some FULLY COOKED chicken tenders in the freezer at the same time! Since I started the “thorough labeling” habit 25 years ago, I always know. So there you go! Another healthy recipe to add to your repertoire! Oh, and those of you who are intermittent fasting, especially those who are following my advice to OMAD/3, think out of the box for that opening snack! 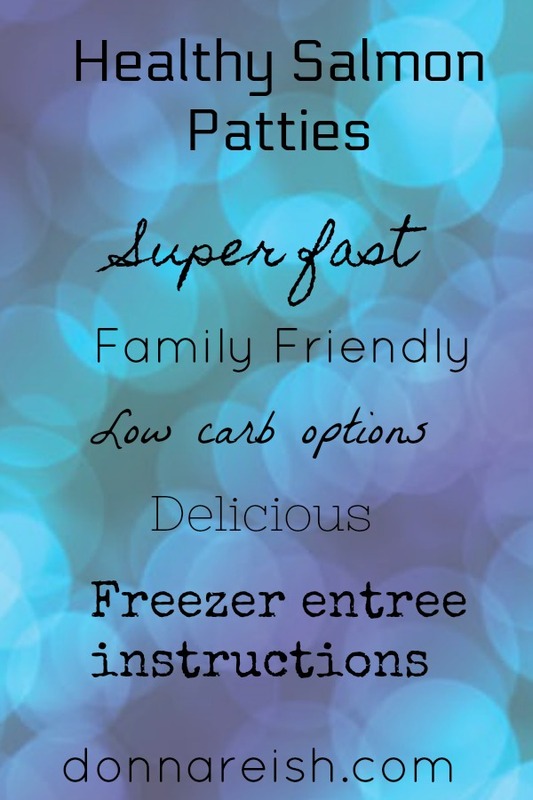 Leftover salmon patties are perfect ways to open your eating window—low carb, good source of protein….yummy. You won’t be craving until your main meal. They’re perfect! Dump salmon into medium mixing bowl (large for freezer option). Remove bones or crush between your fingers and put back into the bowl. Form six patties with your hands and pack gently. I. Melt butter or coconut oil in skillet. II. Place the patties in the skillet and brown on one side. III. Turn them over and brown other side. IV. Place on paper-towel-lined plate and serve warm. I. Form recipe created four times (parenthetical amounts) into 24 patties. III. Flash freeze prior to cooking: Place the 24 patties onto cookie sheets or jelly roll pans lined with parchment and slide into freezer for two to four hours until firm. Remove from freezer and transfer to freezer bags (or foil pans or paper plates that are slid into freezer bags). Label as described below. Fully cooked. Defrost in fridge all day or all night or on counter for a couple of hours. Heat in skillet or microwave until fully warm. RAW. Defrost in fridge all day or all night or on counter for a couple of hours. Cook in butter in skillet until browned on both sides.